Lovers, in the left corner you will find Badgley Mischka’s ever-charming Keeper Pump; in the right corner take a peek at le coquettish Cailyn in Black from rsvp. Though Cailyn sports a slightly lower heel, and slightly bigger bow than Keeper; for just $99.00, as opposed to the $200.00 needed to make the Mischka your own, it is every bit as capable of adding a touch of frilly fabulous to your look du jour, and allows one to pick up a pair in five flirty hues (Black, Ivory, Purple, Red, and Silver ) ideal for making your holiday season merry and bright! OMG, those shoes are breathtakingly beautiful!! Love them both!!! So festive for the holidays. Awesome selection! Love the RSVP. Sweet bows! I'm going with the one I can almost afford! Such a great find! Adoring the affordable one. $200 is not awful for a classic pair of heels so I would go with the Badgley Mischka pair. Badgley gets my vote this time! All about that little bow! You know what I realized I don't have enough of? Shoes with bows. Need that for my holiday outfit! i kind of just want them both for some reason! These are so pretty. Sigh. Ohhhh this is such a good one Erika! I love the ribbon detail! The Mischka is so affordable at $200, and I like the ribbon is on the side of the shoe, rather than pleated--so I would probably spring for that one. Definitely have to go with the Mischkas on this one. I'm actually going to go with the rsvp. The bow on the Badgley just seems a bit overwhelming! I'd definitely be a spendthrift! Okay I just love both this time around. Two pairs please! Ha. The bows are HUGE: I love them both. I agree with MM. Both versions of the shoe were just amazing. I'm looking at the RSVP versions right now. Enjoy your day. Give me the Badgleys. Seriously. Please??? I must be a big spender today because I just love those badgley mischkas. 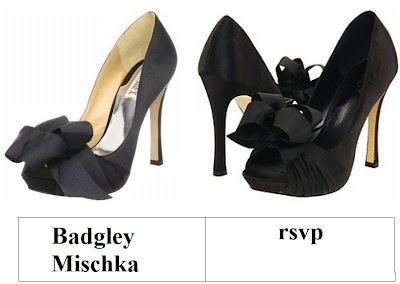 the badgley mischka pair is divine, but i'd have to go for the rsvp ones, they're pretty much the same! Im a little surprised the RSVP pumps are $99.00...so maybe for the brand name, this time I would go for the Badgley Mischkas! PS were hosting a giveaway from 365Hangers!! I actually like the bow better on the RSVP, but like a few others, I'm surprised that brand is so high. I'm used to them being something of a cheapie shoe. Those are just darling! I love the RSVP's. i love both pairs... they are pretty amazing! I love these shoes! great! Réponse S'il Vous Plaît... RSVP. (Answer if it is of your liking.) What a charming name for a shoe brand! I really like this kind of shoes! I think that are very elegant..
they're slightly different but i like them both!